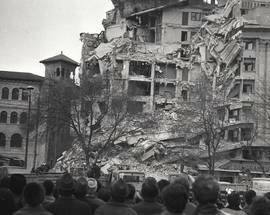 At 21:22, on the evening of March 4, 1977, Bucharest was hit by an earthquake measuring a whopping 7.3 on the Richter scale. It lasted for almost a minute, during which time almost every building in the Romanian capital shook wildly. More than 1,500 people were killed by the quake, including a number of celebrities, most notably comedian Toma Caragiu, at the time the most popular actor in the country. The earthquake – the epicentre of which was in Vrancea – was felt across the whole Balkan peninsula. 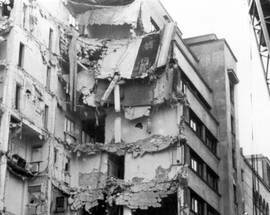 The Bulgarian town of Svistov was badly affected, with three blocks of flats collapsing there: more than 100 people were killed. In Romania, it was not just Bucharest that suffered: the town of Zimnicea on the Danube was almost totally destroyed and countrywide more than 11,500 people were injured, and 35,000 homes destroyed. The terrifying first minute of this video is the only surviving recording of the earthquake. It was made by Romanian Radio, which was recording a concert at the time. Located close to a major fault line, Bucharest has been shaken by a number of major earthquakes over the years. 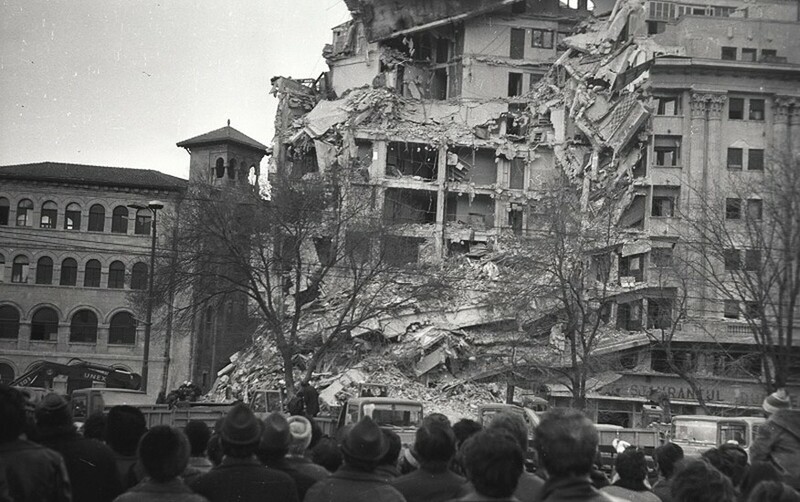 In 1940, more than 300 people died – most of them when the so-called Carlton Block, in Piata Universitatii collapsed – in the first major quake of the modern era. 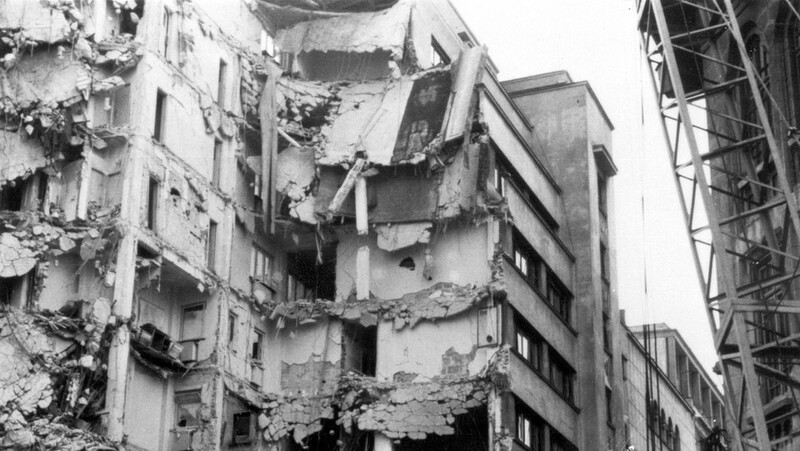 Though few other buildings were fully destroyed, many were damaged, and it was the failure to consolidate these buildings effectively that led to the carnage of the 1977 quake. Romania's dictator Nicolae Ceausescu was in Lagos - enjoying a banquet being held in his honour by Nigeria's equally brutal Olesegun Obasanjo - when told of the earthquake. 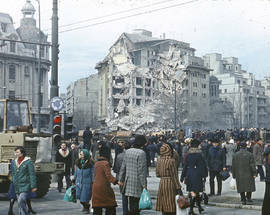 He was initially informed that the entire city of Bucharest had been destroyed: the fact that the city's electricity supply had been completely cut off made communication difficult. It was only towards midnight that partial electricity was restored, and Ceausescu was able to talk to ministers in Romania. He declared a state of emergency, and a plane was sent to bring him home. He arrived at Baneasa airport early the next morning, and immediately visited the worst affected areas of the capital. His general conduct during the days that followed – he ordered the search for survivors to continue after the usual cut-off point and appeared to be a genuinely calming influence on the shaken population – is considered by some to be one of the few commendable moments of his entire dictatorship. There was certainly great political capital to be made out of the earthquake, and Ceausescu's publicists lost no opportunity in doing so. The state-run media reported at great length how the country's emergency systems had functioned perfectly (in fact they hadn't: there was a huge shortage of hospital beds for victims and a lack of blood for transfusions) and that though much international help had been offered, little was needed and little had been taken. In fact, almost all the aid that poured in, from specially-trained search dogs to food and drinking water, was gratefully accepted by the desperate Romanian authorities. 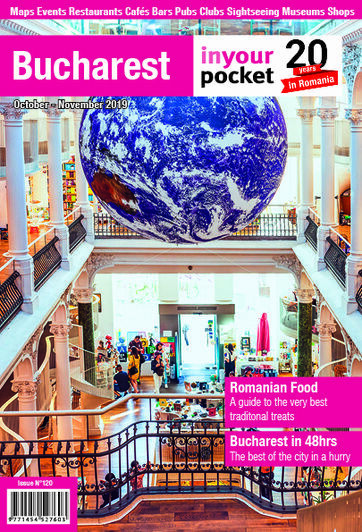 In the long-term, the earthquake changed the face of Bucharest forever. More than 40 apartment blocks were totally destroyed, as well as hundreds of houses. 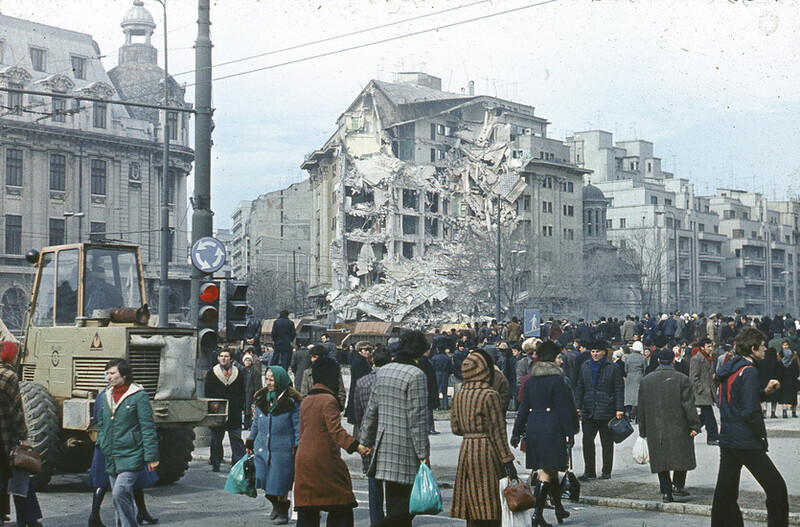 Yet the regime used the very real need to rebuild and consolidate the city as a means to stamp Ceausescu's vision of what a socialist city should look like on the Romanian capital. In many regards, the Centru Civic, and Casa Poporului, had their genesis in the plans drawn up after the 1977 earthquake. 'Earthquake damage' was also used as an excuse to demolish a number of buildings the regime was happy to see the back of: the Ienei Church (Biserica Ienei), which stood opposite the Inter Continental hotel, was one such victim. It was demolished during construction of the block that now stands on the site, for it was said to be a danger to surrounding buildings. If there was a silver lining to the cloud that was the 1977 earthquake, it was in the introduction of strict new construction guidelines: all buildings that have been raised since are thus said to be earthquake proof. However, consolidation of buildings damaged in 1940 and 1977 has still not been fully (or properly) carried out. As such, a number of buildings in the city centre continue to display a red disc, declaring them to be at high risk of falling in Bucharest's next big earthquake. Fortunately, such an event seems unlikely anytime soon: the recent trend of the Valcea fault is towards small tremors which - while scary if you are on an upper floor of a tall building - do no structural damage and by releasing seismic tension make the likelihood of a major quake less probable.